Signing up for the Montreal High Rise Challenge is fast and easy! But you must be at least 16 years old of age. Choose your challenge and click on Register : 5 minutes will be enough for you to enter the information on our secure Web site and pay the $50 registration fee with your credit card. Decide whether you’ll be doing the challenge individually or as a team. In both cases, set a fundraising objective. The minimum is $100 but we’ll show you how you can raise much more! We recommend raising at least $300 for the regular challenge. Every member of the team doing the Frédérick-Duguay challenge must raise a minimum of $480. The minimum set is $750 for the extreme challenge. Additional registration fees of $50 apply for all three challenges. Create your personal fundraising page. If you are a team captain, you can personalize your team page. Using e-mail or social networks, invite friends, family and colleagues to support you by making a donation. You can contact all the people in your address book via your personal page! The Montreal High Rise Challenge is a noble yet demanding exploit and will surely inspire support among your friends and family… They might actually pledge more than you expect! By contributing to your own campaign, you will reach your objective in no time. For more ideas click on our fundraising toolbox. 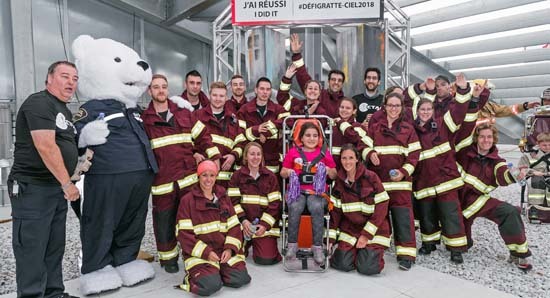 On Saturday, June 1st, 2019, take part in the Montreal High Rise Challenge!